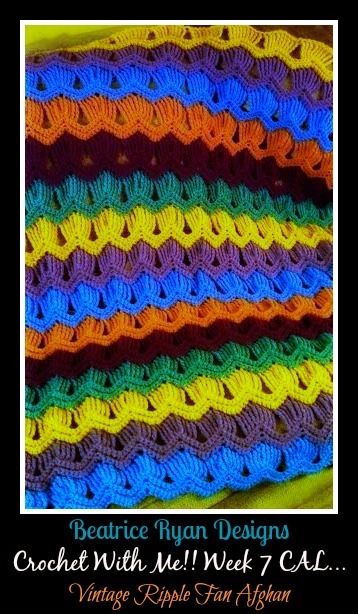 Welcome back to Beatrice Ryan Designs Weekly Crochet~A~Long Segment!! 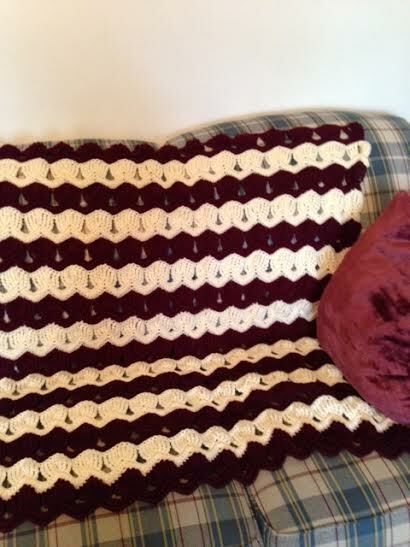 Weeks 1-6 … We have made our way through the first 15 rows of this great Vintage Ripple Fan Afghan by A Creative Being… Make sure to hop over and check out her blog and get the Free instructions!! Here is what my first 6 weeks looks like!! Here is a great photo from one of our participants… I love how she is just using 2 colors!!!! Week 7 Crochet With Me assignment… Let’s do 2 rows this week so we don’t burn out! This will take you through 16-17 color segements!! We are getting so close!! In the next couple weeks I will be having a poll right here so we can choose our next afghan for our 2nd Crochet With Me series!!! So stay tuned and make sure to get your vote in when you see it!! For past Crochet With Me posts, you can click on the tab at the top of the page… Join in anytime!!! And don’t forget to share your photos with us,,, email me at [email protected]! !